Several factors go into making a climate. Those factors also affect what the climate will do. Scientists can then make observations and predictions of what will happen in certain climates. If it's hot today and a storm is coming in, you can guess it will get cooler. More specifically, if it's summer where you live, hot and humid, you might be able to guess that you'll have thunderstorms in the evening. These factors usually happen in the atmosphere in the area you are looking at. There is more water vapor in the air if it is humid. If there is a lot of wind, something is making that wind speed up. It could be a series of mountains, or you could be near the ocean. As we move into these factors, you need to understand that they all affect each other. Examples would show you that higher temperatures might increase evaporation of water that would then increase humidity. The temperature changes throughout the day. At mid-day the temperature gets hot, the land heats up, and air rises. In a coastal area when the air rises, it is replaced by cool air from the ocean. This creates a breeze. When evening comes, the ground cools and the air over the ocean is warmer. The breeze shifts to move towards the ocean. Atmospheric pressure is another important factor. There are large masses of high and low pressure across the Earth. There are also small changes in air pressure that affect you locally. 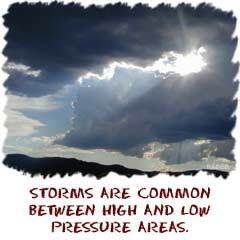 In the borders between high and low pressures you will find storm fronts or smaller changes in weather: temperature, humidity, or cloud cover. The number of clouds and the amount of dust and smog affect local climates by changing the temperature. Increased cloud cover decreases the amount of energy hitting the Earth from the Sun. This decrease in energy lowers temperatures. In an extreme example, something called nuclear winter covers the entire planet with clouds. With no sunlight getting through, the plants begin to die. Humidity is a measure of the water vapor in the surrounding air. As humidity increases, the chances of rain also increase. You see, the air can only hold so much water vapor before it says, "Whoa! I can't do it anymore!" Then it needs to rain. 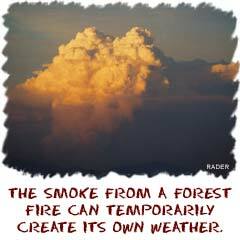 Thunderclouds can be created and violent storms can dump huge amounts of water on the land. Wind speed is that last factor we will cover. When we talked about temperature we discussed on-shore and off-shore winds. Sometimes these can be nice slow breezes and other times very fast and destructive. You may also encounter situations near the base of mountains where changes in temperature create winds that reach 80 miles per hour.